Natbee’s is in the Top 10 Scottish Bloggers list by Vuelio since 2014 and has been nominated as Cosmopolitan’s Best New Fashion Blog 2012 and as Company’s Best Personal Style Blog 2013. 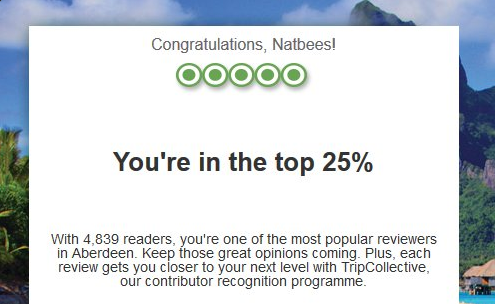 It is also one of the Top TripAdvisor reviewers in Scotland. 15,000+ subscribers via google reader, bloglovin, twitter, instagram, facebook and pinterest. 2. Call me a Dr.! If you wish to work with us please contact us at hi@natbees.com and if you require a full Media Kit please let us know and we will be happy to send it over to you!